A great question has tremendous power. Questions are invitations; a serve waiting for a return, a sound calling for an echo. Classrooms, in my view, are the best places to watch questions influence learning. Questions aren’t created equally. Some questions have power no matter the age level, subject area or context. One of my favorites is “How do you know that?” Adults tend to bristle at this one as it’s interpreted as a suspicion or threat of a claim. But younger people don’t have this baggage. Instead, they pause and really think about it. People don’t often ask this of them. Their answers are hesitant yet thoughtful and unconstrained by ego. Teachers have tremendous influence on this skill as well. I’ve seen many insert sources onto their PowerPoint slides or mention their source while sharing something. It’s also refreshing to hear teachers admit that they don’t always have a good source (yet). Try asking your students today how they know something and take stock of their answers. Are they personal experiences? A source from the internet? Can they analyze the source for bias? Are students aware of publishing dates and author background? One simple question: How do you know that? can indeed change everything. I have a vision of a global community learning platform for teachers around the world to learn, practice, share and improve students’ 21st C skills in critical thinking, communication and collaboration. Similar to, but even better than PLCs and CFGs, they would be small (no more than six people), structured (one person would facilitate) and focused (on five key inquiry strategies that crosscut subject areas/grade level). The diversity of the group would come from their respective geographies (each person would be in a different country/school system) yet would share grade level and/or subject area. These “Global Inquiry Groups” or “GiGs” would be designed for teachers to delve into powerful, research-based instructional strategies by watching short interactive videos together, analyzing and discussing them, reflecting and then practicing in their own classrooms and coming together to share again. As a start, we could provide the first year-long curriculum, and from there, teachers themselves could take over. GiGs would be held monthly for one school year for a total of 8 months (users chose Northern or Southern hemisphere and language group). 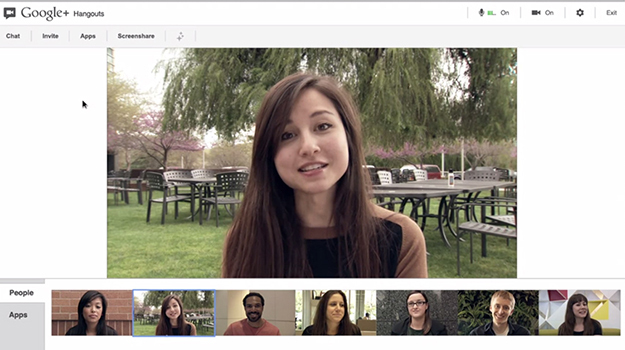 Each GiG session would take place on an existing platform to reduce costs (like Google Hangouts). Obviously, still lots to flesh out here. But curious what my small – but mighty – group of followers here think of this idea so far. Sock it to me, people! Tight shirts, three-bolt cycling shoes and 0% body fat are not my thing. And that, my friends, was the humorous but lame excuse I used for years when asked why I wouldn’t just ride my bike in a city notorious for sluggish traffic. The truth was that bike commuting felt like too big of a behavioral hurdle and identity change for me. I felt intimidated by cars and faster bikers. I wasn’t sure I was in good enough physical shape. Planning my day with a car was hard enough. 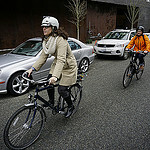 In short, biking felt insurmountable. So instead of conquering it, I ridiculed it. I remember this feeling while working with teachers on incorporating more inquiry into their teaching practice. Why change when current behaviors have essentially “worked” for so long? What will instructional changes mean in terms of identity and relationships with students, colleagues and parents? What is the risk involved regarding student performance on assessments and performance evaluations? Like bike commuting, inquiry teaching can seem insurmountable. Influencing change in human behavior requires many things, but first and foremost it requires a belief that the new behavior will yield some sort of tangible improvement and that one is even able to change at all. Biking has some obvious benefits: increasing fitness levels, helping the environment and saving time & money. The benefits of changing instructional practice are similarly obvious: higher rates of student and teacher engagement, deeper understanding and satisfaction. But even these super juicy carrots, like carrots themselves (sorry Carrot Association), they aren’t always enough of a motivator for people to change. So…what is the motivator for change? Being part of a community of people who are making the same changes is vital. This is where the research around peer pressure is especially interesting and relevant. Tina Rosenberg, author of “Join the Club: How Peer Pressure Can Transform the World” writes that we often view peer pressure only in its negative form. However, peer pressure is used with terrific success in such activities as weight loss (Weight Watchers), alcohol cessation (AA) and social change (mass boycotts). It works in education, too. Anne is one of the black swans of the biking world. Low-key and soft-spoken, Anne festoons her bike basket with colorful Christmas lights. She rides in fashionable boots and a cute trench coat. She moves at her own speed. 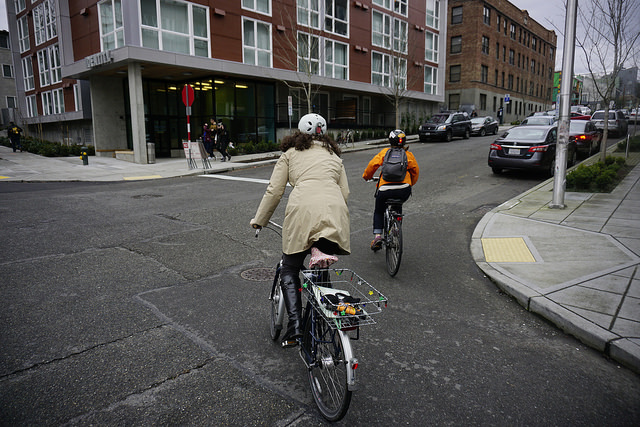 She rides her bike to pick up her kids, her groceries and her dry cleaning. It’s just no big deal. Watching Anne move around my neighborhood motivated me. Turns out, Anne was willing to bring me into her circle of biking enthusiasts. It wasn’t until my fourth year of teaching that I learned about and experienced inquiry-based instruction. I was teaching at an international school in Quito, Ecuador and attended a session where a physics inquiry lesson was simulated for a group of teachers. This experience was a revelation to me and I spent as much time as possible with these inquiry gurus. I soon abandoned the ‘command & control’ approach I was taught in my education courses. I watched videos on inquiry wherever I could find them and continued to seek out and surround myself with colleagues who were doing the same. 2) Real Time Coaching After understanding my goals and preferences for riding (in my case, commuting to and from work), Anne came to my house, showed me city bike maps, gave me a book (the supremely readable Just Ride by Grant Petersen) and handed me a Washington Bicycle Law pocket guide. She took stock of my bike and gear to make sure it was minimally functional and then we were off and biking together, Anne leading the way. She assessed traffic patterns, distance, hills and even mapped out great coffee shops, finding the route that would work best for me. She shouted out pieces of advice during our journey: “Stay away from parked cars in case doors open.” “Make eye contact with the driver here.” “Put just one foot down at this stop sign.” The lessons came quickly; we dealt with impatient drivers who wanted to pass, faster bike riders, car doors, parallel parkers, pedestrians, lights, crosswalks and even pouring rain – all within a 24-minute ride. I learned how to be predictable and when not to be predictable (a little wobble every once in awhile keeps drivers on their toes apparently). The chaperoned ride experience helped me conquer any doubts I may have harbored about my ability to do this. I could and I did. This year a few high school teachers allowed me into their classrooms to do some real-time coaching. Students were engaged in the lesson coaching and analysis as well; answering questions like like: “Do you need a minute to reflect here?” or “Which of these questions do you want to tackle the most/least?” Rarely do they see their teachers being coached or reflecting on their craft. Suddenly, their own teacher was making mistakes, learning and growing right before their very eyes. The lesson became a backdrop to other, more enduring, lessons and the energy in the room shifted, opened and yes, a beam of light shone I’m sure through the windows. When I get off my bike, I feel a sense of real accomplishment. I’ve cleared my head and pushed fresh air in and out of my lungs. I’ve taken charge, made big decisions and been brave. It’s how I feel every time I teach, too. We all need “Ride Guides,” and not just for biking but for any significant behavioral changes we want to make in our lives. If you don’t have any yet, how can you find them? 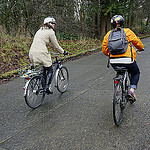 Bike commuting and inquiry instruction both still feel ‘fringy’ to me. How can we support one another so that inquiry teaching is more the default pedagogy rather than an edgy alternative? Who are your instructional “Ride Guides”? 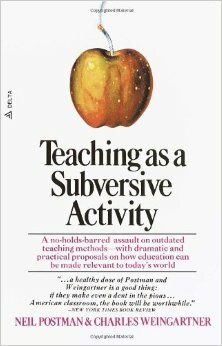 I don’t remember who gave me my first copy of Teaching As A Subversive Activity (TASA); but I do remember it sitting on my office bookshelf for at least a decade before I ever cracked it. Presciently landing in my suitcase during a move to Buenos Aires, Argentina, it slipped onto yet another shelf. Soon after learning that checking my cell phone on crowded commuter collectivos in the Paris of South America wasn’t the best idea (I watched at least a dozen phones stolen right out of people’s hands during my two years there), I read books; the kinds printed on real paper. I read an hour every morning and an hour every evening standing up with sweat trickling down my back and a heavy backpack strapped to my chest. Having finished all the fiction I brought down with me, I desperately plucked TASA off the shelf. Published the same year I was born, 1968, TASA promotes such outlandish ideas as “requiring every teacher to provide some sort of evidence that s/he has had a loving relationship with at least one other human being” and “limiting each teacher to three declarative sentences and 15 interrogatives per class.” I suppose every year in human history can be described as radical…but 1968 seemed to really go for it. The authors, Drs. Neil Postman & Charles Weingartner, serious academics and men of their time (Postman an English professor at NYU and Weingartner a lecturer at Queens College), entitled their apple bomb’s first chapter “crap detecting.” What??!! This was NOT the book I was expecting at all. And I loved it. On page 60 (opening the “What’s Worth Knowing?” chapter) the authors challenge their readers to “suppose all of the syllabi and curricula and textbooks in the schools disappeared…Suppose you decide to have the entire ‘curriculum’ consist of questions… What would you do?” Page 61 is blank. I have to hand it to the authors to offer us physical space to conceive of questions before providing some of their own. Radical at the time. What is ‘change’? • What is ‘progress’? • How do you know when a good or live idea becomes a bad or dead idea? • What are the greatest threats to all forms of life? • What’s worth knowing and how do you decide? Nearly 45 years later, a young teacher named Sergio Juárez Correa was called “radical” because he dared to implement inquiry-based instruction and other outrageous practices straight out of TASA and the Hole in the Wall experiment in a very traditional Mexican school culture. His students soared – even measured by traditional tests. Where are the radical ideas in education today? Are they all focused on “edtech” disruption? Are they radicals with fires in their bellies about equity and excellence or are they savvy entrepreneurs just making things easier and more efficient for everybody? Who are your favorite radicals calling for specific, actionable major changes in education? Are the egg-breakers of 1968 still out there? Is This Idea Seat Taken? My most creative thinking occurs while doing the dishes, unpacking groceries or shuttling my kids to and from various sports practices. Mindless, repetitive activity spurs me. These creative thoughts often radiate directly from personal pain points and, when I’m feeling productive, will transition into dreamy “What if…” scenarios and eventually some tentative problem-solving. It’s magic…and fleeting. Soccer practice super shuttles. Self-cleaning refrigerators. Elves that grade essays for tired teachers. World peace through inquiry teaching. I’ll come up with all sorts of potentially disruptive ideas, daydreaming about an honorary doctorate. My next move is deadly. Instead of writing the magical thinking down or pursuing it with any seriousness…I consult my computer. As soon as as I see the long line of “o”s in flash across my screen, my creative thought balloon pops before it even had time to lift off. Apparently, I quickly confirm, thousands of people around the world have either started non-profits, written books or delivered engaging TED talks about the exact same idea. Who am I to pursue this idea? In fact, I am willing to bet that the content of this blog post has already been written before, several times over. Pop! Should we abandon all these unoriginal ideas, assuming they’ve been reserved like a sweater assertively draped over theater seat ? No. We cannot be intimidated by the fact that we are all iterating and riffing off similar ideas all the time. Perhaps that seat’s really not taken; it’s a lost sweater or belongs to the person sitting in the seat behind. 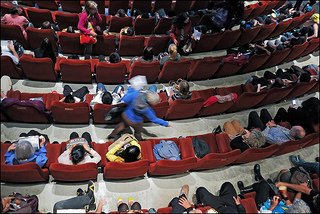 Or maybe it is taken…but that doesn’t mean I cannot sit in the theater, too, right? Right. Upon launching a new organization this year called Inquiry Partners, I’ve learned to come to peace with iterating on others’ great ideas. Inquiry-based instruction is not new. Not even close. I’m in awe of Hattie, Stigler, Dweck, Dewey, Willingham, Mazur, November…and on and on and on. But my take on their work is unique and how I present and communicate inquiry to those who have not heard of it yet…well, that is new. So, until every classroom sings with creativity, hums with student inquiry, and vibrates purpose and joy, I will not rest. Instead, I will learn from the best, iterate and share what I’ve learned with others. No seat is taken. Join me. I watched the #1 most-watched TED talk today…again. Sir Ken Robinson, as wobbly on his feet as he is unfaltering with his words that one day back in 2006, made me smile and nod…again. He gets an audience belly laugh within 30 seconds of lumbering onstage. This particular talk has been viewed more than 29 million times since then. Why? Well, we all love a good British brogue (I’ve witnessed it move audiences easily through twenty minutes of nonsense), but it’s more than his adorable accent: Sir Ken is a marvel. Unlike most TED talks he uses no media whatsoever. He’s a stand up comic with a serious message and impeccable timing. He weaves hilarious stories with wonderful metaphors and holds up a (fairly non-judgmental) mirror to the absurdity of our global obsession with “core subjects” and traditional schooling. He’s measured and folksy, referencing prior talks from the week…seemingly making connections right there in the moment. His conclusion is fairly incontrovertible: we need to promote more creativity and honor student individuality in our global school systems Yes; genius! I don’t even really care that Sir Ken offers no solutions (though he follows up with concrete ideas in a subsequent TED talk). All I want to do is sit in the comfort of a worn Starbucks lounge chair, earphoned head in hand with a silly grin on my face, and listen to him entertain me. The #2 most-viewed TED talk belongs to a vibrant researcher, Amy Cuddy from Harvard, who makes full use of a her PowerPoint slides with stock photos, funny video clips, high-level statistics and text. She gets emotional and shows vulnerability (the theme of another highly-rated TED talk, incidentally). I could listen to these great talks for hours; and often have. I love me a good TED talk is my point. Judging by the popularity of TED…we all do…and ideas are spreading. But what are we really learning? We are getting better at listening and assimilating new information. And, we are all too often confusing a super TED talk with great teaching. And that, my friends, is my problem with TED talks. In countless classrooms around the United States, I see teachers appropriating the TED talk format to perform in front of a passive (if happy) audience of students. However, unless the audience is interacting and practicing skills (communication, critical thinking, problem solving, creating), these replicated TED talks are not helping people develop new skills. A TED talk is scholarly entertainment and should probably have more of a supporting, not starring role, in the classrooms of the 21st Century. We know who learns the most from a great TED talk: the TED talker! So, in addition to cutting back on the 6-periods of TED talks many students experience, let’s ask students to research and create their own TED talks. Or, let’s start to suggest that TED talks incorporate some audience participation; you know, insert a “Turn & Talk” every now and then; ask the audience to read or write and make claims and conjectures; ask them to go home and conduct some research and do something with whatever it is they are ‘learning’ from their chair. 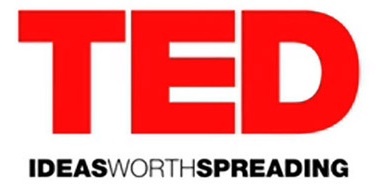 Now, that’s a TED talk I can really get excited about. Inquiry is a way of teaching that allows students to build upon their prior understanding and experiences. Students are given the primary responsibility for constructing knowledge and understanding, developing new skills and revising their beliefs about how the world works, or should work. It’s highly engaging and student-centered. That’s my definition, but it doesn’t really tell us much. To muddy the waters even more, many people describe inquiry not as a set of specific strategies enacted by teachers, but as a disposition or stance. While this is true, explaining it in this way doesn’t help teachers with implementation. Following a “belief follows practice” approach is why we started with simulating and demonstrating inquiry followed by reflecting upon five key inquiry strategies modeled in these simulations and demos. Let’s keep adding to this list, shall we? Email me at kimberly@inquirypartners.com. Kira and Michael take on the world!